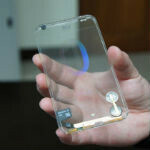 It's been the dream for years and years: transparent computer displays, and transparent phones. We've seen them over and over in sci-fi, and we've seen plenty of device render concepts, but this is the first real prototype that we've seen in real life. The key to it is the transparent display that has been developed by Taiwan-based Polytron Technologies. We first saw the display tech from Polytron a couple weeks ago, but we're getting more info on it, and more importantly video. As you can see in the video below, all they have so far is a very very early prototype, almost just a proof-of-concept, but the team expects to have a more fully functioning prototype with working software by the end of the year. You'll also notice that the device isn't 100% transparent, because some components - the battery, SD card, and microphones - simply can't be made transparent right now. Still, it's a pretty cool start. The display is what Polytron calls Switchable Glass technology, which is a conductive OLED. When the phone is powered off, the liquid crystal molecules in the display are a cloudy white, but when you turn on the juice (electricity running through transparent wires), the liquid crystal molecules realign to form text, icons, etc. There is no word on when the displays will go into production, but Polytron general manager Sam Yu says it will be "near the end of 2013". Yu also said that Polytron is in serious discussions with "major smartphone makers" across the US, Europe, Japan, and South Korea to bring the display to market. Whats the point? So people can see everything I'm doing? No thank you. Voice to text is better. what about using the technology in the screen of the car, so you can see a virtual path over the current road telling you which lane you should be in and where to take the next turn? Just an example. LOL - Maybe this might put an end to those stories of people falling into holes or walking into light poles while texting? exactly what i was thinking... & w/o a case, what if you step on it? It's like a waterproof phone, what's the practical use of this other than making the geek leak? I disagree about waterproof phone. Waterproof phone = Your phone won't die when doused. Transparent phone = You can see through your phone. One is useful, the other is not, quite the opposite in my opinion. You see a transparent phone and I see HUDs for all sorts of applications from winshields to glasses, mirrors and so on..! Applaud the effort.... Use is a secondary concept. Hope to see more innovations in this 1080p & quadcore mad race.